Cocktails have a specific language and nomenclature – there are flips, sours, fizzes, collinses, and many more. But oddly, up until recently, there was no common name for the fairly large group of low- alcohol cocktails – those made with 1/2 ounce or less of a strong spirit (40% alcohol by volume). Dinah of the bibulo.us blog has righted this wrong by coming up with THE perfect name for low alcohol cocktails: she calls them “shims”, because they “keep you level”! She is hosting this month’s Mixology Monday and chose this topic, not entirely coincidentally, because shims are the subject of her new book, which I plan to add to my cocktail book collection very soon. For MXMO I decided to look no further than the contents of my fridge to come up with a refreshing and tasty shim of my own. 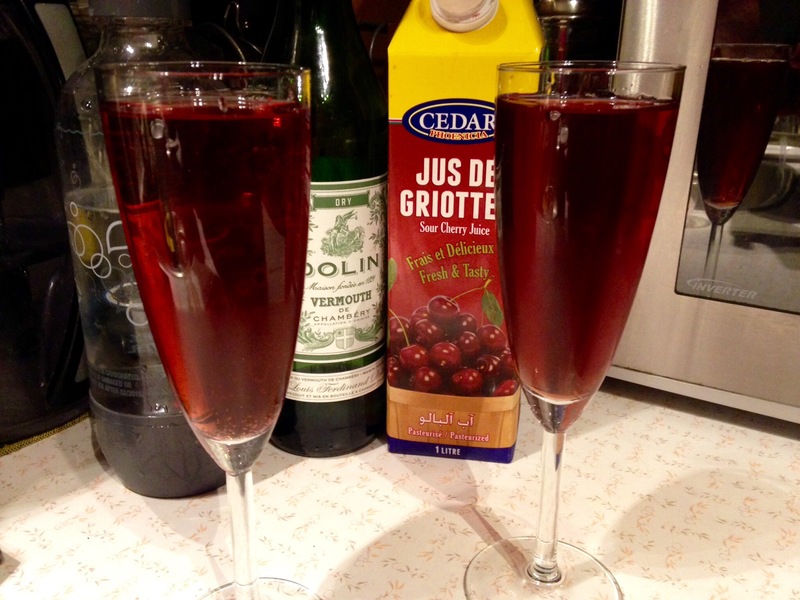 Pour juice and vermouth into a champagne flute and top with chilled sparkling water. Here is the round-up of all the MXMO shims! This entry was posted in Cocktails and tagged jus de griottes, sour cherry juice, vermouth by deliciouscocktailtime. Bookmark the permalink.